August 6, 2005: Windy River Cave, Van Buren County, Tennessee. 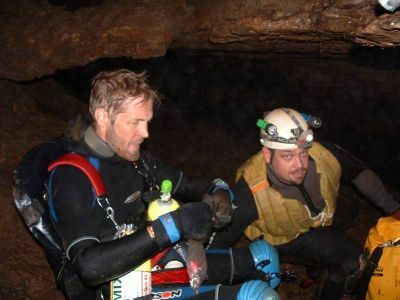 Attempting to make a cave connection through a sump is difficult at best, but it’s even more difficult to find (coerce) the right cavers (anyone breathing ) to drag gear over a mile through cave passage alternating between long swims and breakdown climbs, only to reach the destination where they sit and freeze while waiting for the diver to come back. The first few times you ask for help you generally get a few enthusiastic folks, and most cavers are always good for a trip they haven’t been on. But try talking them into coming back, same cave, same tanks, same long cold swim…. different day and well, let’s just say you have to wait a long time for the sherpas to forget about the last trip before they are willing to do it all again. This was not the first Windy River sump trip. Previously we had multiple teams consisting of at least 15 cavers to carry gear for a simultaneous upstream and downstream push. 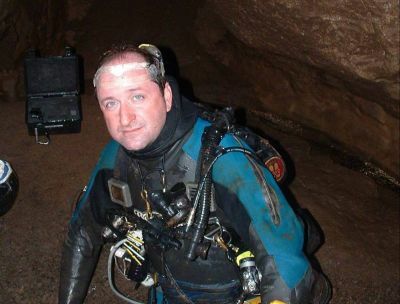 Trip report at: http://www.caves.com/fss/pages/trips/SumpDiving8-16-03.htm . The subsequent trips were progressively more difficult to muster volunteers willing to make the push downstream through the 55 degree water hauling tanks and gear. So we really thought we had waited long enough for the horrors to subside and we would be able to “wrangle” enough sherpas for another assault on the upstream sump. Guess 2 years isn’t long enough ! The plan for this trip was to head upstream and try to make the connection and get the survey data through the sump. Additionally, a new, knotted line would need to be run through the passage to facilitate the survey. We needed two divers. One to go re-lay line and the next to make the final push and try to get as much survey as possible, then next to make the connection to BRRC. That was the successful part. We had 5 cavers to get all this gear upstream to the sump.….that was the frustrating part. Gear for the trip consisted of: 4 AL 30’s rigged sidemount, two harness systems, 8 lights, 2 exploration reels, 2 safety reels, 4 sets of regs, assorted back-ups, tools, silt screws, fins, 20 lbs of weight, and all the usual personal gear including food, water and extra polypro. This is a lot of gear for 5 cavers to move through a mile worth of difficult passage. Fortunately we were able to drive the bottom of the valley which shortened the hike but we still had a long way to the cave entrance. The plan was for Marbry to make the first dive and try to crack the sump. I would make the next dive and try to get some survey. Things don’t always work out the way you have it planned, but this is where the biggest asset of a caver comes in to play….flexibility. Making last minute changes and still getting the job done. Upon unloading the gear Marbry discovered that he had forgotten his harness. The plans quickly changed and now it was down to Forrest and me for the dives. No problem, we’ll make it work. After a couple hours of swimming and scrambling over breakdown, we arrived at the staging area some 800 ft before the sump. This is the last dry ground to gear up on and it’s all swimming after this point. I drew the lucky straw and got to dive first. To me, every dive is a survey dive, so I decided to lay new line and get as much survey as I could, then Forrest could come in and continue the exploration. Marbry and Mark swam up to the terminal point with me then headed back to the staging area as I tied off and proceeded into the sump, running new knotted line in as I went to facilitate the survey. The passage ceiling fell away in several places and I surfaced 3 different times in fissures approximately 40 to 50 ft long and between 10 and 20 feet high. After 225 ft, I left a loop on the end, turned the dive and surveyed out. Total dive time was 45 minutes, max depth = 19 ft. Arriving back at the staging area I gave a quick report about the going passage and it was time for the next diver. Tired muscles stiffen up nicely while waiting for the returning diver and Forrest had decided not to dive. I was still “motivated”, so we switched my rig over to the remaining 2 tanks and back I went. This time I wanted to make the connection if possible, so I ran straight to the end of the line, tied off and started exploring on. TJ had described a gradual slope where he had run out of line and after I tied in, the passage did begin to trend upward. Continuing on for another 55 ft., I found my way up through the breakdown and into a large air-filled room with a huge mud bank tumbling down to the sumps edge. I had never been in the pit room in BRRC, but this seemed to be similar to what Marbry had described. Caution is required in all forms of caving but even more so when you are the only one on the other side of a sump in unknown passage. I slowly made my way up this muddy slope, crawling and digging steps as I went. Upon reaching the top I could see that the room was approximately 50 to 60 ft to the ceiling, and 30 to 40 ft wide with a bend around to large breakdown. I chose not to go further as the mud made the conditions slightly “technical” and any misstep would mean a long fall with a questionable outcome. After finding a protrusion to tie-off on, I left a line arrow for a survey marker and proceeded to slip and slide my way back down to the sump. Everything was covered in mud and I even had to scrap my boots off before getting my fins back on. This was going to reduce visibility back through the sump to 0 so after I eased into the water I set a silt screw on the bank at waters edge and made one final tie-off. Still needing to get the last of the survey, I made my way to the first station and took a quick backsight before being engulfed in silt. The trip back out was uneventful and the silt cleared near the end. Arriving back at the staging area one hour later, we were all ready to head out by this time. We quickly repacked and began the long trip out…..dreaming of Mexican food and Dos Equis awaiting us in McMinnville. 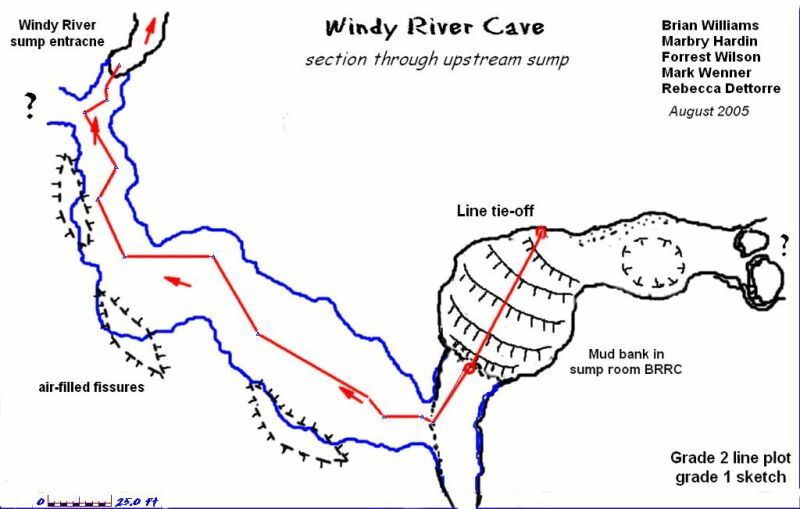 The Windy River Cave system is rich in aquatic cave life including schools of Blind Cave fish and of course a myriad of cave adapted crayfish. The Cumberland Plateau has some of the most diverse and rich ecosystems of any caves I have ever seen and it’s fortunate that there are cavers willing to chart these passages and turn over this data to the State which allows informative decisions to be made regarding the protection of watersheds and natural recharge areas associated with these cave systems. 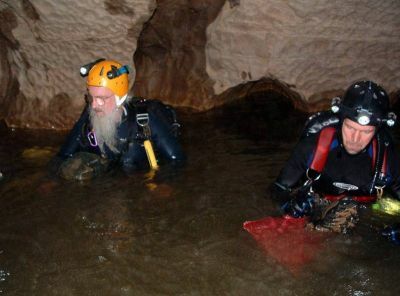 These are not your average caving trips and could not be possible without a dedicated group of cavers willing to make the hard trips in the name of exploration. Special thanks to The Tennessee Central Basin Grotto, and all the cavers that have been involved with the mapping projects in this area over the years.